Now we are in the season where you will be mowing your turf regularly it is important to note the benefits your grass clippings can have instead of throwing them away. Here we are going to list some of the ways to recycle clippings (from grass that has not been treated with pesticides or herbicides) as a result of mowing your turf in a more environmental friendly way. Grass clippings from your garden turf are an excellent food source of nutrients for farm animals such as sheep or cows as well as household pets like rabbits and guinea pigs. As well as being a healthy resource of food for animals it is a great way of saving you money on shop bought animal food. Ensure that you keep the turf clippings dry and not allowed to ferment as this can be detrimental to the animals. Garden turf clippings are a great source of nitrogen, phosphorus and potassium. Adding the clippings to your compost can be of great benefit as the lawn turf clippings act as green matter to brown matter after they have been dried. Many experts recommend 1 part green matter to 2 parts brown for successful composting. By spreading a covering of dried turf clippings you can significantly reduce the amount of watering required by trees, bushes and other plants in your garden. As the grass decomposes it is able to mix into the soil to provide a source of enrichment. 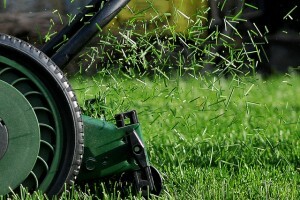 Lawn turf clippings can also serve as a greener form of weed control. By using your turf clippings to cover the soil where your turf isn’t as thick, the lawn turf clippings act as a block to deter any weeds from growing through thus avoiding the need for environmentally dangerous herbicides. To ensure this method of weed control has minimum benefit to you it is ideal to pull out the roots of any weeds which have already grown through your turf. There are many methods that you can use to help you achieve the perfect garden turf. Keep an eye on our blog as we will post a host of helpful resources to to help you get the perfect lawn.